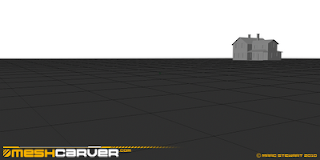 I've added another concept picture to my main site, but here's a cheeky shot of the basic perspective for the scene. It's a really simple composition, but I thought it best to do a quick model in 3D to set up the angle and perspective, and chose to place the camera at a realistic height of about 1:75 meters, so it looks like eye level. I also added a grid on the ground plane to help me with the distancing and scales. It was a compromise of getting enough of the ground in the shot to show some details like the stop sign with rubbish and the dead maize field etc, and placing the farm at a nice distance to show some of it's details too. If the camera is too low, then it's a lot more difficult to describe ground details but the farm looked a bit more dramatic, so I tried to find a middle ground and balance the two. Anyway, what are you waiting for..? Make haste to my main site..! Begone..!!! BEGONE..!! !